Glooko is a company focused on making a life with diabetes more simple. With their syncing devices and accompanying app, managing diabetes has become a cinch. 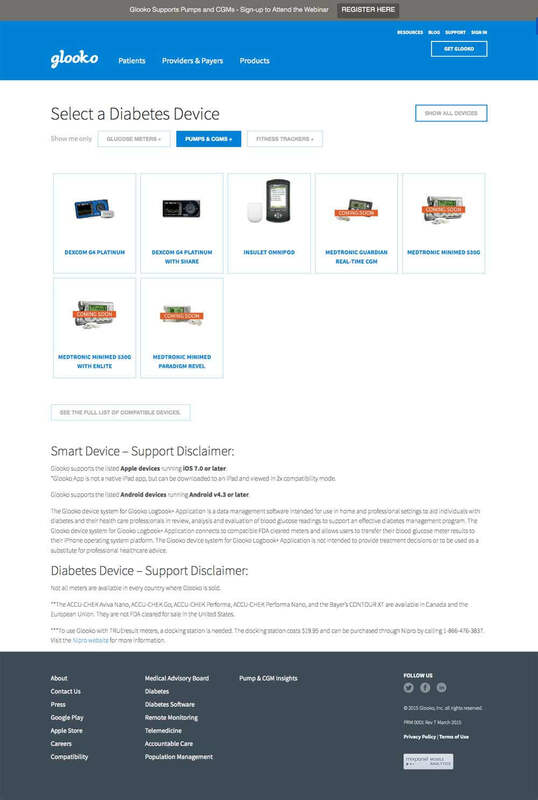 Glooko needed a page that allowed their customers to easily sift through a complex array of compatible glucose meters, pumps, and fitness apps. Their former page required seven clicks to get the compatible sync meter and was not easily editable by the team at Glooko. With some creative thinking, we crafted an experience that not only guided customers to the compatible Glooko sync device in the fewest number of clicks but also allowed the team at Glooko to easily update their ever-growing list of devices.